Food, fun, and fandemonium go first class at The Corner Alley. It’s an ALL-NEW sports bar experience that you have to see to believe. Our electric atmosphere, state-of-the-art bowling alleys, delicious culinary creations, and ultra high-def TVs make us the best place in Cleveland to watch a game or just have a great time.  Conveniently located on East 4th street, The Corner Alley is at the heart of Downtown CLE. Eclectic tastes meet electric fun at The Corner Alley. Whether you’re looking for a scrumptious meal or trendy cocktail selection, or a place to cheer on your favorite sports team, we are game for always showing you a good time. With a range of state-of-the-art lanes and spaces in one of Cleveland’s most vibrant neighborhoods, there’s a lane for you no matter how you roll. Our spaces are also perfect for your next party or corporate event. From bowling tournaments to bourbon tastings, treat your guests to a one-of-a-kind experience in a fun, modern atmosphere. Dine on Americana-inspired fare or sip bourbon in the heart of downtown Cleveland, The Corner Alley is your place for the best in all-inclusive dining and entertainment. Newly-Renovated and Better Than Ever! Having undergone major renovations in Summer 2015, The Corner Alley Downtown is back and better than ever! Situated in Cleveland’s East Fourth Neighborhood, The Corner Alley Downtown offers a range of culinary and entertainment options, including a 16-lane bowling alley, 4k HDTV’s featuring live sports and the NFL Sunday Ticket®, a walk-up bar with 24 drafts and an extensive bourbon selection, a casual dining restaurant featuring Americana-inspired cuisine, and dedicated rooms for parties and groups. The venue features open patios, an open-air bar with more than 50 high-top and shared seats and an open space that serves as both a dining room and a setting for live entertainment. Visitors will also enjoy a wide variety of games and entertainment such as video games, shuffleboard, air hockey, foosball, and more. The Corner Alley is the ultimate entertainment destination. With state-of-the-art bowling, delicious meals, an expansive drink selection, and a modern atmosphere full of fun and energy, you'll always enjoy rolling with us. Americana-inspired cuisine with everything from scrumptious salads and delicious pizzas to gourmet sandwiches and a wide selection of vegetarian options. From local craft brews to special bourbons, we serve up specialty beverages for any taste. You’ll be able to find a selection from behind the bar sure to delight any taste or connoisseur. Our state-of-the-art alley in Downtown CLE adds a fun, edgy twist to your bowling night or mid-day excursion. Come out and roll with The Corner Alley! It's the ultimate experience. 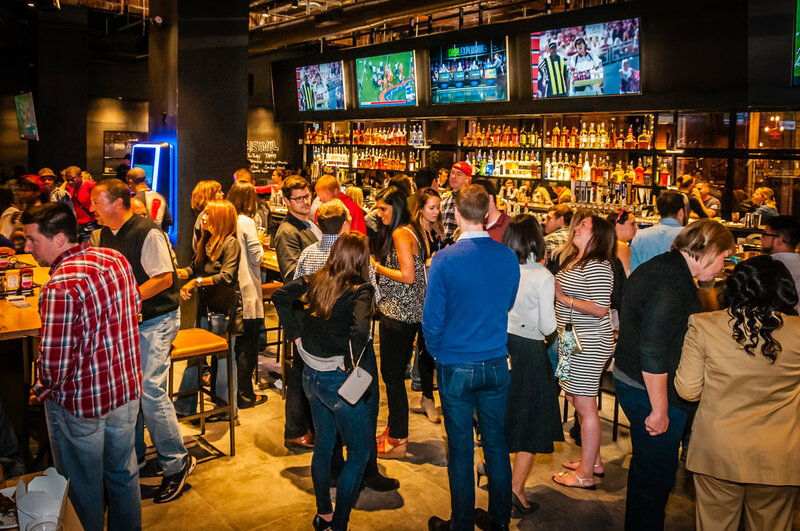 Treat your party guests to a one-of-a-kind experience in a fun, modern atmosphere. Our team will customize an unforgettable event for your company, your group, or your party.